In America, we have cute gender reveal parties with colored balloons or cupcakes to discover if the parents-to-be will be welcoming a little girl or a little boy. In Afghanistan, the gender of your children has direct and irrevocable consequences for your family. Women are blamed for not producing a male heir, despite the scientific evidence that the father determines the gender of his children. Male children have the freedom to play outside and the ability to bring income to the family. Girls, on the other hand, must remain inside and are a burden to the family resources until they can hopefully be married off. Out of this dichotomy, a third kind of child emerges. A bacha posh is a girl who is presented to the world as a boy. This may create the kind of luck needed to have an actual boy in the future or just give a child the opportunity to experience a world that will later be closed to them. But what are the repercussions for girls who live as boys only to be forced into the oppressive world of women? Jenny Nordberg is a reporter who studied this phenomenon of the bacha posh. She discovered that this practice is common knowledge, but it is not something that is discussed. Nordberg sought out these children, their families, and the women who had to put aside their freedom to become wives and mothers. Readers will meet a female politician who decides to turn her fourth daughter into a son, a mother who spent her childhood as a boy, and a young woman who refuses to go back to a small life after the freedom of masculinity. Nordberg is a careful story teller as she reveals details of the lives these women lead. She is careful not to offend her subjects or their families, although she clearly finds many practices and ideas wrong. As you read through these chapters, you can't help but root for these women and want more for them. The end of the books includes notes about what happened to the women after the book ended, but I still found myself wondering about their lives now and if talking with Nordberg changed their ideas about gender and about their own goals and dreams. One of the most interesting moments for me was Nordberg's discussion with various Afghani people about the idea of gender. The men she spoke to defined gender as anatomical, with preference obviously given to the stronger and smarter males. But many of the women she spoke with defined gender as freedom and opportunity. To the women closed behind the doors of the family home, being a man had little to do with your body and everything to do with the ability to make choices, both minute and important, about your own life. This is an important book for both men and women to read. 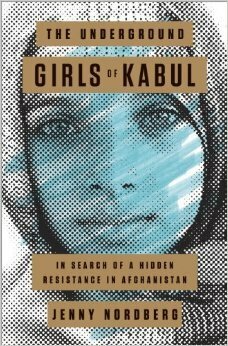 The Underground Girls of Kabul gives readers a rare glimpse of the hopes, dreams, and conflicts of the women of Afghanistan. The bacha posh who we meet within these pages give us hope that they could someday enjoy the freedom of boyhood as girls and women. Oh my gosh, I thought I was up to date on current events in other parts of the world, and I had never heard of this practice. Thank you for a good review-- I've seen the book online and didn't bother reading the blurb because it was another memoir of living in the middle east. Thanks! You are off to a great start this new year, Lindsey, lots of interesting posts and books read and reviewed! What was fascinating to me was that the bacha posh are an accepted practice in Afghanistan, but no one wants to talk about them to outsiders. I didn't know about it either! What a beautiful review! I am off to check whether this is on my TBR list. Thanks Irene. I hope you get the chance to read it! Mmm...this book sounds really good. I've read quite a few books about Afghanistan. It's such an interesting culture and country. I can see that I'm going to have to read this one, too. Thanks for the great review! Yes, there are so many interesting cultures to read about! What are some of your favorite reads about Afghanistan? I've never heard of anything like this, but I'm glad that there are people out there willing to investigate and illuminate the rest of us. Definitely! It was fascinating to read Nordberg's notes at the end. She writes that the only person in the book who is a composite is her translator/guide. She had several, but made them a composite for ease of storytelling and for their safety. It's not something that we would think about in the US! This sounds really interesting, I'm adding it to my wishlist. Wonderful! I hope you learn as much as I did. Great review! I thought this was a fantastic, enlightening book and I also would love to know how the women in the book are doing now. Maybe we should ask her to do a follow-up, although I imagine she has moved on to a new project!